Let me start by telling you that there are many ‘wrong’ ways and many right ways to rehabilitate a horse that has a halter or bridle trauma. Here is my story in which I share the wrong and the right strategy. This is Punky. His problem was that no one, except the owner, could halter him. You can see how that can be a daily stress for both horse and humans in a boarding facility, right? The wrong way is to go straight to problem solving. That is what we humans like to do, it is natural to us and it has been reinforced all our lives that this is the way to do it. I started the ‘wrong’ way, which was pretty much what most horse trainers would do. When I was training Punky, I thought I could skip my own Key Lessons and ‘just teach the horse to be OK with a halter’. I thought just teaching Punky to target the halter would be the one and only step to desensitize him. I envisioned that the next step could be the haltering. Easy-peasy. It was a bit more complex than that and I learned how valuable the HippoLogic Key Lessons really are. For all trainers. We can’t skip steps because it is the horse who determines how many steps are needed, not the trainer. When I started out teaching Punky to target his halter, he became really excited about all the treats he was (in his mind!) ‘suddenly’ receiving. I needed to teach him Key Lesson ‘Table Manners for Horses’ in order to keep my fingers safe and to teach him that a food reward only can be expected after the click. He started to mug me more and more. Again, I had to lower my criteria about his learning curve. I realized that I should have taught him Key Lesson ‘Patience’ (move his head out of my space in order not to mug me) before I taught him anything else. Then, when I thought I was ready to work on ‘desensitization of the halter’ I noticed that he wouldn’t even wanted to come near a halter. Every time I wanted to halter him he put his head up to prevent me from haltering him. I decided to teach him Key Lesson ‘Targeting’ (nose and ears) so I could bring the halter near his body and ask him to touch the halter with his nose. This wasn’t enough to halter him. Now he was OK with touching the halter with his nose and even putting his nose into the nose band, but he was still putting his head up and backing up when I wanted to pull the halter over his ears. Keep your head down until I close the snap. In other words: I was lumping instead of splitting the goal behaviour. A pitfall all trainers need to beware of. This was a valuable experience for me. Now I start all horses I train, teaching them my Key Lessons. No matter what I think they already can do or what I ‘think I can skip’. Building a solid foundation first, speeds up training instead of slowing it down! How you can turn basic exercises as ‘Table Manners’ for Horses and ‘Patience’ into tools is discussed in part I. Read here part II where you can learn how to use Key Lessons Targeting and Mat training to train complex behaviours. Read part III to learn how you can use Key Lessons Head lowering and Backing for advanced training purposes. If you think this is a blog that someone can benefit from, please use one of the share buttons below. Or post your comment, I read them all! Comments are good reinforcers. Sign up for HippoLogic’s newsletter (it’s free and it comes with a gift) or visit HippoLogic’s website and discover my online 8 week course ‘Ultimate Horse Training Formula: Key Lessons, Your Key to Success’ that will change your life. Is there a support group for animal trainers like Trainers Anonymous? I need them! Yes, I have to admit it: I am addicted to the sound of the click. First of all: a click means “Horse, you did the right thing” and that means that I, the trainer, have booked a success, too. And I am addicted to success. Before clicker training, I was always telling myself what I did wrong, instead of what I could improve. I would see my failures instead of my triumphs. Second: I just love to feed animals. I don’t know why, but it is very enticing and rewarding for me. The more I click the more I am allowed to feed my horse. I realized one day I was addicted to clicking my horse. It really felt like an addiction because it felt like a computer game with a victory tune to announce you have completed this level and you can go on to the next. Is it dangerous? Could it be detrimental to the training? would do with a success rate of 90% or more. The key is to write down goals, make a training plan and keep a training journal in which you describe in positive words what you’ve accomplished in your training. I can recommend it to every one to find a support group/friend with whom you can share your successes and points to improve. Talking about your training with others can help you reflect and stay motivated. 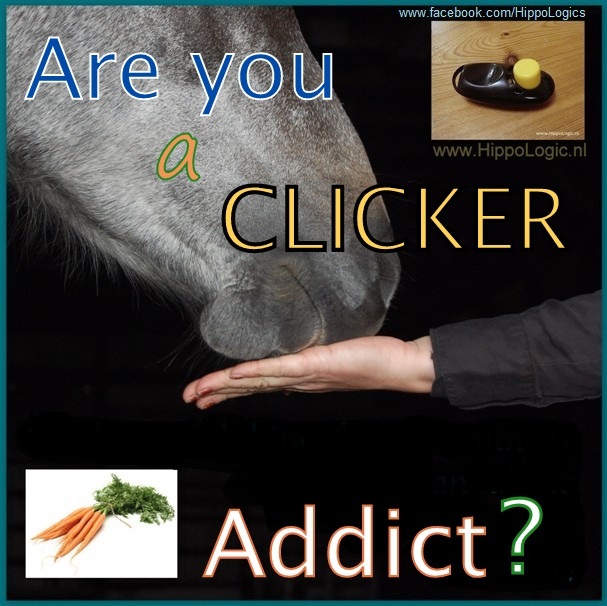 With clicker training ‘Less can be more’. 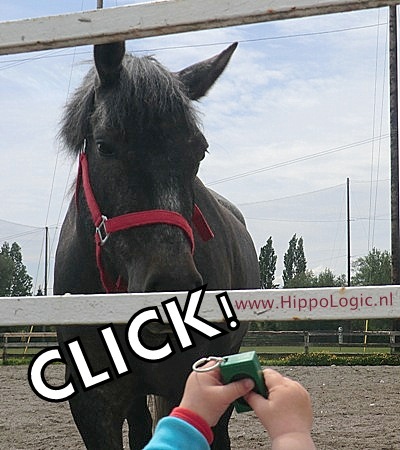 If you click less, the horse will answer with better tries. Sometimes you get amazing results, like I described in this post. For instance I don’t click Kyra for coming to me in walk. I’ve set her up for success so I could click her for coming to me in trot. The goal I am working on now is asking Kyra to come to me in canter. Since I click less, Kyra is improving significantly in all behaviours and therefor the click has become even more addictive to me. It is as if I have moved up multiple levels in our game and a whole new world has opened. I am definitely high on our success and craving more. PS If you really need a ‘Trainers Anonymous‘ group or want to be part of a supportive R+ community check out HippoLogic membership. 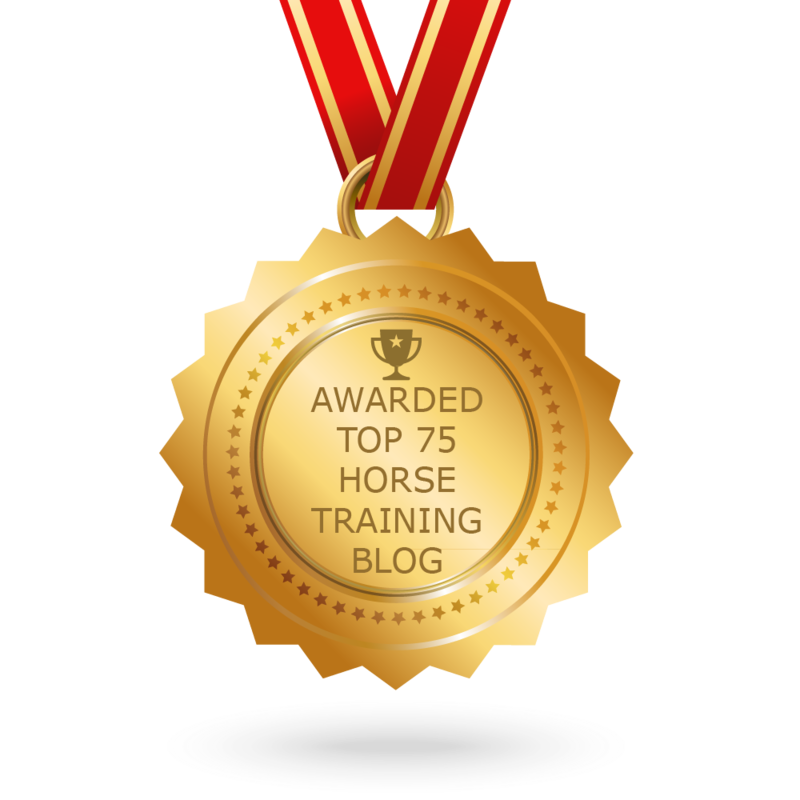 We have a great community that supports you in accomplishing your goals with clicker training and improving the relationship with your horse in training.